Jack Nicklaus' design team renovated the premier Bay Point Marriott Resort golf course in Panama City Beach, Fla., formerly knows as Lagoons Legend, two years ago. The new Nicklaus course has some enticing risk-reward options. PANAMA CITY BEACH, Fla. - Imagine being a pampered guest at a nice Florida golf resort. The service is first-class, the food great, the amenities everything you could ask for. You're nice and stress-free, as laid-back as Perry Como, but a little tired of lounging around the pool. You decide to get a little exercise. You call the pro shop and set up a tee time at the golf course. You're looking for a nice relaxing day on the links, but - here, imagine the voice of Rod Serling - little do you know you will find yourself spinning out of control, double-bogey, triple-bogey, fairway moguls, water carries on the resort course from hell. You walk off 18, beaten, bedraggled and completely demoralized. You slink back to the pool like a whipped cur, where you know your place. That is probably fairly close to the experience many resort guests may have had at the old Lagoons Legend here at the Bay Point Marriott Resort. Resort courses, for the most part, have to toe the line between challenge and playability, usually tilting toward the latter. Nothing too difficult to spoil that pampered feeling, or to slow the pace of play. Some resort courses step out of line from time to time and ratchet up the difficulty, but Lagoons became legendary for what it did to resort guests. Sporting a whopping slope rating of 157 - anything in the 140s is considered very difficult - the course could boast being one of the hardest in the nation. Two years ago, the Nicklaus Design team was commissioned at the request of course management company Honours Golf to take the bite out of the Doberman. Gary Nicklaus and senior Nicklaus designer Chris Cochran did just that. They took the severe moguls out of the fairways, toned down the green complexes and generally turned the-course-that-devoured-resort-guests monster into one that massaged them. The result, two years later, is a superb resort course, now referred to as the Nicklaus course, that is a pleasure to play. Are there those who miss the beatings they took? Sure, there always are. "I've yet to hear anybody complain about any aspect of the golf course," Head Professional Jay Iskow said. "Now, there are guys who enjoyed getting beat up, and they miss that, but that's only a handful." Bay Point can still hand you your lumps if you choose to play it from the tips, at more than 7,100 yards. Try the 234-yard par-3 17th if you don't believe me. Still, it is a much more reasonable course now, even if there are a number of forced carries, off the tee and into greens, and some hidden obstacles to boot. In fact, the first five holes throw forced carries at you off the tee, including No. 2, a 194-yard par-3. No. 3 requires a carry over more water and a bridge, as does No. 4. No. 5 is a doozy: There's about a 200-yard carry off the 5 tee, over marsh, but if you go over 250, you'll run out of fairway. Then, your approach shot is again over water to a green that sits at a 90-degree angle left of the fairway. So, to recap: You can still get your thrills at Bay Point's premier course. (The Meadows is the other, much easier layout). The redesign radically altered the Robert von Haage work, but it is still a very imaginative layout, with flair and scenery, particularly the portion of the front nine that plays along St. Andrews Bay. 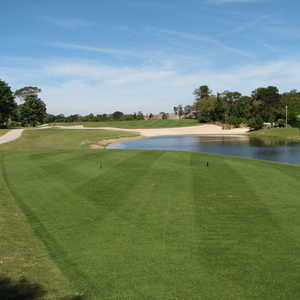 The course has excellent movement and flow, and the fairways are gracefully contoured. The green complexes are interesting, though the greens themselves are relatively flat. There is an excellent mix of holes, not a dud on the course. Nicklaus almost always gives you a bailout area close to the hard-to-hit greens, which show that closely-mown Nicklaus trademark. The fairways are generous for the most part, so your driver isn't the challenge here. It's getting to the green afterward. "I'd say the main focus for the average player is midiron play," Iskow said. "You're usually about 170-190 yards out, if you're playing from the back tees." Green fees are in the $80-100 range. The service is excellent, and the practice facility is superb: I love hitting unlimited quality range balls, something you can't always take for granted even at ritzy resort clubs. 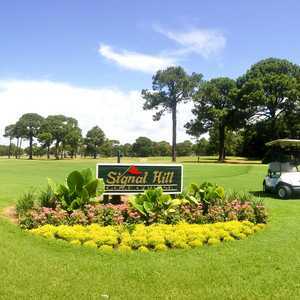 This is must-play golf in the Panama City area. The Bay Point Marriott Resort is an oasis in what can be a very busy beach scene when playing golf in Panama City Beach. It's situated on a 1,100-acre wildlife sanctuary and overlooks St. Andrews Bay - not quite the Gulf of Mexico, but a beautiful view nonetheless, with the added bonus that the bay doesn't attract the hordes of spring-breakers that drove me nuts at another, unnamed, Gulf-front Panama City Beach resort. I become Crabby Appleson when I don't get enough sleep. The Marriott has been recently renovated - the finishing touches were still being put on during my visit - and has 356 guest rooms, including 78 golf villas. The facility has 40,000 square feet of meeting space, four restaurants, a newly renovated spa and fitness center, one indoor pool and three more outdoors. There is a private bay/beach area for those looking to be alone - almost a private island, in essence - and, for the active-minded, there are seaplane rides, beach volleyball, kayaks and jet skis, as well as a host of other water sports.